This rug is so colorful and such great quality! I have it in my kitchen and it's perfect! Highly recommended! This is a beautiful and colorful rug - just perfect for our cabana! Good quality and value. Beautiful well made rug with vibrant colors. I also purchased one of the round ones. They are stunning. Absolutely love this rug! Well made and good quality! Had this rug for about 5 years now. Can be cleaned with extraction and does not bleed. Still looks lovely. I get lots of compliments! Has a hole in it . Looks like it was snagged. Nice thick material, but not bright and vibrant like picture. Wouldn't have bought it, had I seen it in person. I was hoping this wouldn't happen but the loops are getting caught in the vacuum brush roller. I'll need to return this. Have 2 parrots and this will look great near their cages! Living in Fla. This will be a great conversation piece too! 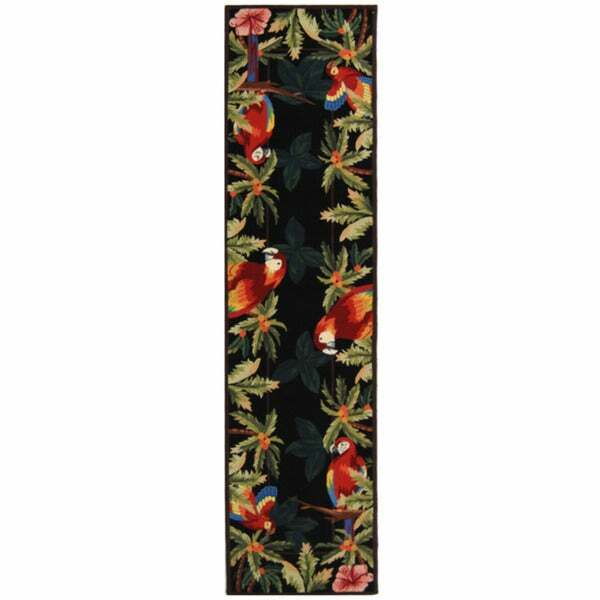 Safavieh Hand-hooked Parrots Black Wool Rug - 5'-3" X 8'-3"